You can look up patents and trademarks in the LexisNexis database. 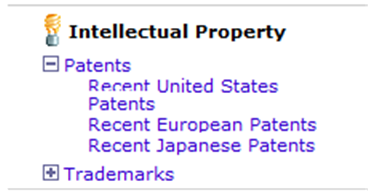 You can also search patents in general in LexisNexis. Again, select By Content Type then Patents. Or, you can use the US Patent Office website, but you can’t search by company so well. They also have trademarks, BTW.